Various sections of Paint Creek throughout Washington C.H. were flooded Thursday following large amounts of rainfall. 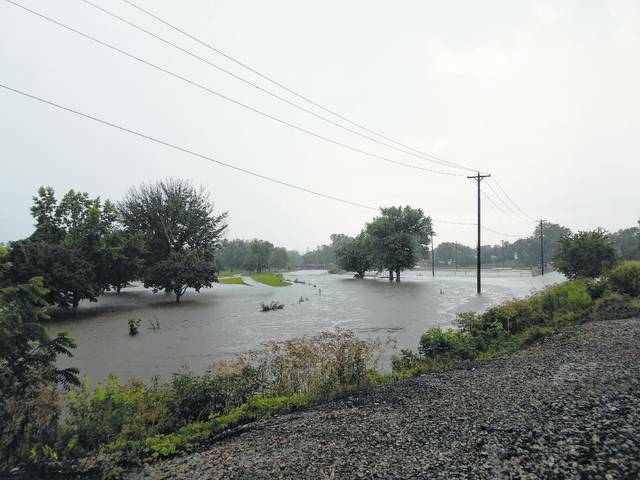 Fayette County felt the impact of severe weather Thursday as Eyman Park, and portions of Paint Creek in other parts of Washington C.H., became flooded from excessive rain. City Manager Joe Denen urged the community to be safe and said that playing in large ditches of water can be dangerous due to fast moving water. https://www.recordherald.com/wp-content/uploads/sites/27/2017/07/web1_20170713_132136.jpgFayette County felt the impact of severe weather Thursday as Eyman Park, and portions of Paint Creek in other parts of Washington C.H., became flooded from excessive rain. City Manager Joe Denen urged the community to be safe and said that playing in large ditches of water can be dangerous due to fast moving water. Video Caption: Various sections of Paint Creek throughout Washington C.H. were flooded Thursday following large amounts of rainfall.